In mid-May we were off to Europe again for another summer in our campervan. It had been stored safely locked away in a farm in Dorset, and after the farmer had met us at the station we were delighted to find the van washed, warmed up and ready to go. A few days later we had crossed the Channel and returned to the Somme, where we explored in more depth than during the previous year, concentrating this time on the part played by Australians in the WW1. 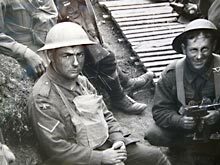 Many had survived Gallipoli only to die in the mud of north-east France, but those who were able to fight on played a major part in reversing the last thrust of the German army and bringing about the armistice. Over a school playground in Villers Bretonneux hangs the sign, “Do Not Forget Australia”. We returned to Paris for meetings at the FIA and then struck off fast to the south via the autoroutes to Marseilles. 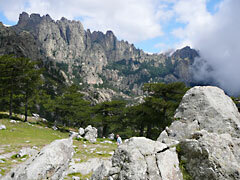 From there we took an overnight ferry to Corsica, one of the main targets for this year’s trip. Being one of the crossroads island in the Mediterranean, Corsica has a long and turbulent history extending back to Neolithic times, with interesting megalithic, Roman and medieval settlements. One of Europe’s great drives took us through the Col de Bavella, with jagged lines of mountain tops leading up to the main sight, the Aiguilles de Bavella, a spectacularly steep and dramatic group of spires. The west coast and mountains present a challenge to the driver and anyone who, unlike us, has a large motorhome. The roads are very narrow and tortuous, so that a few moments after saying “wow” at some more spectacular scenery we would have to come to a halt and probably reverse to allow a truck or bus to come past. The east coast is easier going, but not nearly so attractive, but in any event all round the island there are beautiful little ports, good walks and enjoyable boat trips. Another ferry ride took us over to the west coast of Italy at Livorno, from where we headed swiftly south to a very pleasant camp site on the shore of Lago Bracciano, just north of Rome. We stayed a few days to rest and regroup, and for a visit to the important historic site at Cerveteri, the 10th Century BC Necropolis of Banditaccia. With very few other visitors we walked the streets of round and underground tombs, some with colourful frescoes and reliefs. 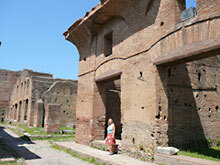 We enjoyed more ancient history at marvellous Ostia Antica, once a huge Roman city and port on what are now the outskirts of Rome, but again blessedly quiet compared to the more touristy sites near the city. We were pleased to encounter a great Italian custom, which is that seniors get free entry to such places depending on various qualifications, but we always seemed to qualify! Pressing on southwards down the coast we moved again into modern war history mode, this time WW2, passing the Anzio beaches and then cutting inland to Monte Cassino. 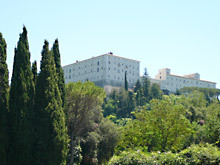 At the peak of the mountain now rests in peace the wonderfully reconstructed abbey, the birthplace of the Benedictine movement and the scene of one of the most dramatic, heroic and important battles of the war. We caught the autostrada for a fast leg yet further south, and also to bypass Naples and to avoid roads where southern Italian drivers and scooterists appeared all to have the notion that suicide under the wheels of a campervan was easy. The target was a little camp site practically right opposite the gates to Pompeii which, while still an extraordinarily impressive set of ruins, is a less enjoyable visit than when we were first there many years ago. It is oppressively crowded now, packed with tour groups led by guides trying to shout over each other. 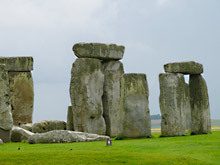 Many of the most significant domestic dwellings and other buildings were closed, and there is little or no attempt to place artefacts in context – most pots and human “casts” are lined up in sheds. 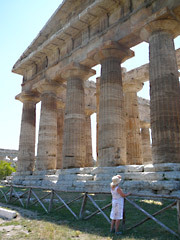 The southernmost target of this part of the trip was the beautiful, peaceful site at Paestum. The three graceful Greek temples are among the best preserved monuments of the period in the world, and we remembered them well from our visit in 1966 on our way back from three years in Cyprus. It has hardly changed at all, except for some more extensive and sympathetic excavation of the foundations of what was a major city. From here we turned north, for a series of very scenic drives, basically following the spine of the Apennines through the Abruzzi and Umbria and thus to the gorgeous medieval town of Assisi. We skipped through Tuscany, having spent some considerable time there only a few years ago, but went on to stay a couple of days at Ferrara. This is a magnificent, walled Renaissance city, with an important university and a gorgeous central piazza overlooked by the magnificent Castello d’Estense, a fortified palace of the Este family. And so to Venice, another major target and a return to the lagoon we cruised in Cera for three weeks in 1987. We camped at a splendid site on the mainland peninsula at the entrance to the lagoon, from where we could take a ferry to the city or any of the other islands. 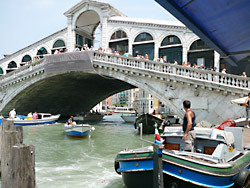 We are very fond of Venice, following our several visits, so have visited most of the major points of interest before. We “did” a few again, including the Doges’ Palace with its collection of masterpieces by Titian, Veronese, Bellini and their local contemporaries. But the city was becoming hot and crowded, so we took to the waterways with ferry day passes, transiting the Grand Canal (of course! ), and revisiting most of the small islands via the channels we remembered so well from our time on the boat. Finally in Italy, and again with more nostalgia, we drove north to take the spectacular “standard” run through the Dolomites from Bolzano to Cortina, taking in the several wonderful passes through the mountains and taking long and sometimes tough walks starting from the top of various cable car runs. Descending from the mountains into the valleys, we drove through villages with houses of traditional Italian style sympathetically mixed with new Tyrolean dwellings, with a tendency to a more cubic style as we approached Slovenia. Slovenia was new to us, but something of a revelation as a go-ahead and friendly nation with a most interesting but very complicated and battle-scarred history. We did a big loop through the western half of the small country, with some wonderful highlights. 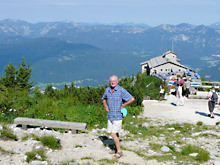 A large part of the region is a national park, including the Julian Alps. These, like the Dolomites of which they are an extension, feature high, vertical craggy mountain faces through which the passes wind, again with a high “wow” factor. Deep in between the mountains lie fast rivers such as the Soca, blue and tumultuous as they rush through the rocks. At Ljubljana, from a very upmarket (unusual for us) camp site with a fantastic set of swimming pools we rode the #1 bus into the clean, pretty, flower-bedecked city. We took a simple little car-carrying train through the mountains to Bled, a colourful little town on a gorgeous lake – many tourists by this time, but not overwhelming in numbers. Some British campers we had met spend their whole summer holidays in Bled, and we can understand that. North again to Austria, for only a couple of days but through the country on another of the great drives of the world, the Grossglockner High Alpine Road. 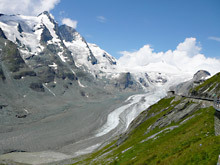 This peaks at over 2,500 metres, and embraces extraordinary views of the Grossglockner and Johannisberg mountains and the Pasterze glacier. Lots of people and traffic, here in late July, but the roads and driving standards presented no problems for us or our travelling home. There are no discernable borders between Austria and Germany these days, and we meandered from one country to the other in the Berchtesgaden. At a camp site on the fiord-like Konigsee we were overlooked by Hitler’s “Eagle’s Nest”, the Kehlsteinhaus. This is reached by a (mandatory) bus up a very steep and narrow road to a parking area, from which the visitor walks a marble-lined tunnel to an extraordinary gilded lift that ascends 124 metres to the top and the building so familiar from Leni Riefenstahl’s photos and movies. The reconstructed summerhouse is now a cafe and restaurant, with brightly-coloured umbrellas that add an incongruous note to the less happy connotations of its history. Down in the valley below are the remains of the Berghof, Hitler’s headquarters, where there is a frank and outspoken new museum of National Socialism and the rise and fall of the Third Reich. This has been built over the unrestored tunnels, bunkers and underground halls from where much of Germany’s war was run, once fully airconditioned but dank and gloomy now. Salzburg was a happier place and a beautiful city, and we switched mode from war history to the history of music. Mozart’s residence was very well presented, with excellent audioguides giving a good commentary on the items and pictures displayed, and playing appropriate Mozart music. Father Leopold and sister Nannerl were also featured. We enjoyed a birthday dinner and concert in the castle, and spent the night along with several other motorhomes in a large car park just across the river from the city. Criss-crossing more borders between Austria and Germany we reached southern Bavaria, the start of the Romantische Strasse and one of the most popular tourist destinations in the world. Here were built the fortresses and folly castles of Maximilian II and his son, “mad” King Ludwig. The most famous of these is Schloss Neuschwanstein. This supposedly fairy-tale-like castle was Ludwig’s tribute to his friend Richard Wagner, who stayed and played there. 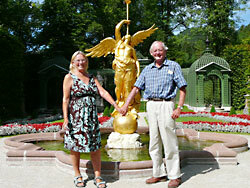 In the grounds there is a “Venus Grotto” where Ludwig could lie alone in a boat shaped as a swan and listen to the composer’s Venusberg music played by his private orchestra. 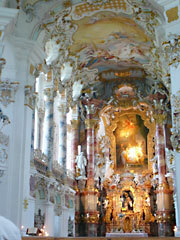 North on the Romantische Strasse (and to our relief leaving the heavy tourist overload behind) took us to some absolutely gorgeous churches, such as the Church of the Scourged Saviour, with simply one of the most beautiful interiors we have ever seen. The route runs through a series of lovely, walled medieval towns such as Nordlingen, with its streets in concentric circles around the busy market square. Incredibly, a plaque told us that its sister city was Wagga Wagga! Further north, in the Marienberg fortress at Wurzburg we came across a marvellous exhibition of the woodcarvings and sculptures of Tilman Riemenschneider, new to us but a genius whose work can be seen all over Germany. And so to Eisenach, the birthplace of J S Bach and the site of the Bachhaus. This is a house near where he was actually born, but reconstructed in a style and with furniture representative of the period. It also holds the most comprehensive exhibition of Bach material in the world, marvellously presented, with hands-on demonstrations of Bach-era instruments and booths with recorded music and explanations. It was all really too much to take in during one day, for a Bach enthusiast. 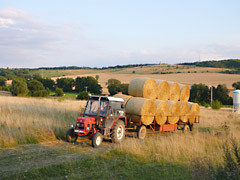 We were firmly in what used to be East Germany by this time, and stayed in a small motorhome park by a farm, where a Soviet-era tractor chugged up and down the hill alongside us. Now, however, there are few signs of the Soviet partition, but a great deal of reconstruction and roadbuilding. The latter made navigation in some towns challenging, because as the roads in the centres were dug up we were often faced by the dreaded “Umleitung” (deviation) sign and a nightmarish wiggle through narrow side streets. 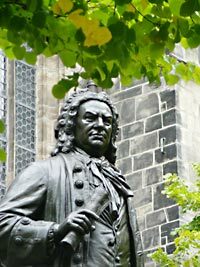 Following Bach’s journeys through Germany we came to Leipzig and the churches where he famously played for so long. Notably, of course, these included the austere but lovely church of St Nicholas and the famous 15th Century Thomaskirche, where he was Capellmeister for 27 years and now lies under a bronze plate in the choir. En route from there to Dresden we paid an interesting visit to Colditz castle, a POW camp for officers only, where they achieved the extraordinary feat of building a glider in a hidden loft, in which two of them planned to be launched off the roof and over the nearby river on their way to an escape. The end of the war meant that the one they built never flew, but a replica later built in England successfully did so. 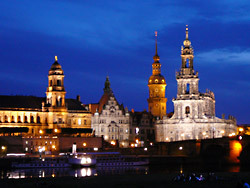 The miraculous city of Dresden is another masterful reconstruction, controversially demolished by allied bombs in early 1945. Again, we camped in a convenient motorhome park just across the river, with a fine view of this beautiful place, spectacularly lit at night. There’s too much to see in Dresden even briefly to mention, but the spell-binding collection of old masters in the Zwinger complex has to be an exception, being as it is one of the most important art galleries in Europe. From there we took a scenic route through the Spreewald, with its low-lying rivers and canals, and on to Berlin. Berlin, of course, is another great city that has had to be rebuilt since the war, and like others we have visited on this trip and before, the work has been done in a careful and sympathetic manner. 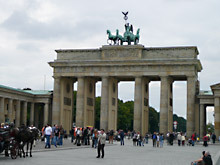 Berlin is massive and monumental, in its size and in the style of its architecture. We walked famous streets such as the Unter den Linden and through the Brandenburg Gate, and spent a fascinating day at the new and wonderful Deutsches Historiches Museum. This complex embraces an astounding collection of displays, far too much to take in during one day. Memories of wartime are awakened all over the city, with bits and pieces of the Berlin wall still to be seen, and its original route picked out by a line of paving stones. On the way west from Berlin we visited Wittenberg, where a monastery where Martin Luther was a monk has a superb exposition of this influential man’s life and times; he truly did change the course of history in Europe. Finally in Germany, we had the great pleasure of staying for a few days In Munster with friends we had made way back in the Dolomites, and who introduced us to the beauties and interesting history of the Munsterland. Our last few days on the Continent were spent in the Netherlands, through which we had driven in years gone by but never stopped to explore. 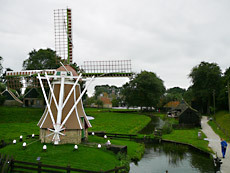 But there is much to see, including Amsterdam and its canals and the Museum of the Zuiderzee, where the history of Dutch life is laid out in reconstructed villages and commercial centres. Memories of our visit to the Netherlands is to some extent dominated by its waterways and boats, and by the fact that it is bicycle-land incarnate. Bikes have (or take) priority pretty well everywhere, presenting a new challenge to the driver who not only has to negotiate powered traffic but thousands of bicycles as well. We took the ferry back to England from the Hook of Holland to Harwich, and on the way to visit relatives and friends we called in to Cambridge in what for Michael was a nostalgic reminder of his undergraduate days. Having lived in college and in digs both very close to the Fitzwilliam Museum, after 40 years he finally got to visit this wonderful place. We also spent a day at the Imperial war Museum at Duxford, with its outstanding displays of aircraft and aviation history. Particularly interesting to us were a Dan-Air airliner identical to that in which Norma used to ferry Grand Prix drivers to races all over Europe, and a Hastings of the kind from which Michael parachuted during service with the RAF in Cyprus. During the European summer of 2008 we wallowed in history, music, art and scenery of a variety that could hardly be matched. Reluctantly leaving the van at its home in a barn in Dorset, we resolved to return in 2009 and plan yet more extensive adventures.